This time of year we are reminded that the only thing close to that exciting first week of school will be your first week at a new job. 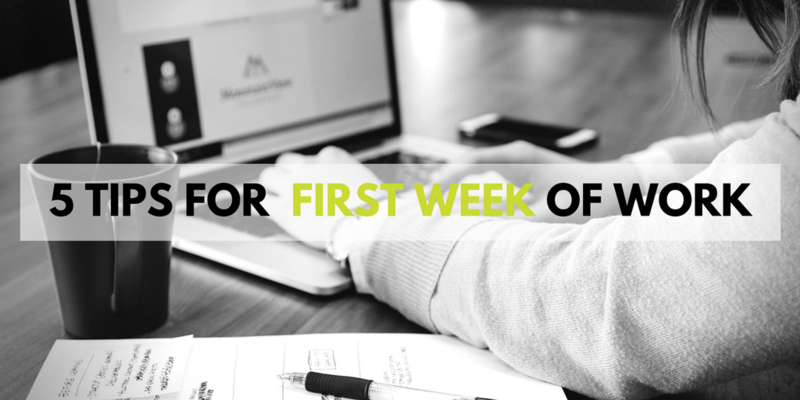 Your first week is critical for navigating the company’s culture and making a great first impression on your new coworkers and boss. We thought we would share a few ways to pass your first week with flying colors, and maybe even a few new happy hour buddies. Find your non-boss buddy – Your first week is full of meeting new people, navigating a new building, and getting used to new corporate practices. While your new boss can help you learn the ropes for the most part, you need a non-boss buddy to ask those very important questions like where is the bathroom? And how does lunch typically work around here? This person will become invaluable with helping you learn the culture from an insider’s perspective as well as just showing you where the nearest coffee shop is for those occasional caffeine emergencies. 2. Get organized – A new job is a clean slate, a chance to do all the things you were “going to get to one day” at your old gig. Your first week will likely be filled with intro meetings and training, but there will likely be some blocks where you are expected to just hang out between appointments and peruse the company’s web pages or intranet. Use the downtime in your first week to create master folders on your computer, streamline your email inbox, start creating outlook tasks for yourself, and get a good planner/calendar if you need a paper version. 3. Start putting your money where your mouth is – If you made some promises in your interview, week one is the time to start acting on them. Make a list of all the ways your skills can benefit the company and start working on ways to execute. This is a great starter project to bring to your first week recap meeting and will show you are there to do what you were hired for. 4. Take inventory – Fresh eyes are an additional benefit for any company that adds a new hire. No one can see the company in the way a newcomer can. Use this superpower to your advantage by making a list of all the things you see or read that bring up questions for you. It’s very likely these are things no one has noticed, at least not in the way you have. 5. Update LinkedIn – The first week, you will likely be researched by your new coworkers, so go ahead and update your profile to reflect your current position so they know it’s you and can be reminded what your title is in case they aren’t sure. Another great way to keep track of all the new people you meet is to make a note of their name and then go back to your desk and add them on LinkedIn. This solidifies your connection and lets you learn a little more about your new colleague right away. Now that you know what to do during your first week, we just need to get you that job… click here for current openings.